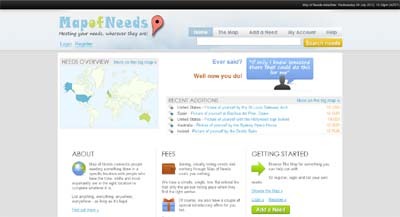 Map of Needs connects people needing something done in a specific location with people who have the time, skills and most importantly are in the right location to complete whatever it is. MapofNeeds.com stands out from the crowd by offering a global, yet targeted reach, no restrictions on what can be listed(other than needing to be legal) and we have a simple, low referral fee. We don’t get involved or facilitate monetary transactions between members, and as such, we don’t take any percentages. The site is very easy to use and offers visual representations on where needs are required.